I’m loving every last bite of this salad, this is the kind of food I like the most. When I think of salads, I imagine a bowl full of veggies with grains or crunchy nuts. 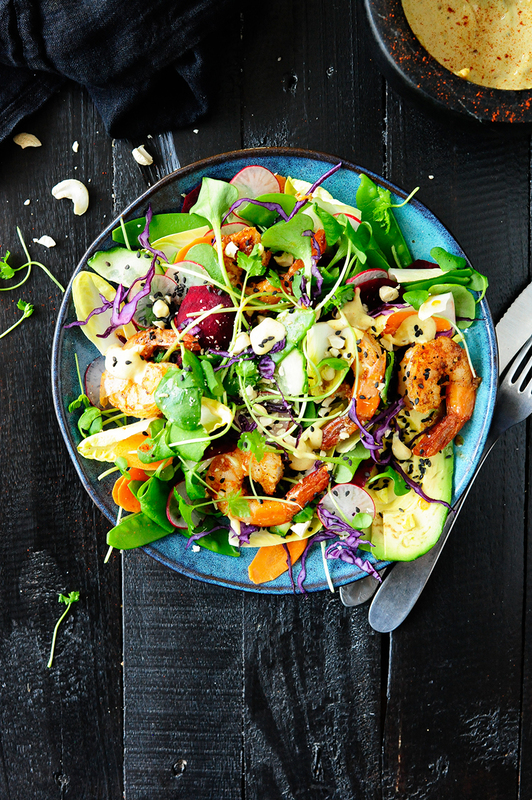 Like this colorful salad with lots of vegetables, shrimps, cashews and sliced avocado. I finished it off with a sprinkle of tahini dressing. 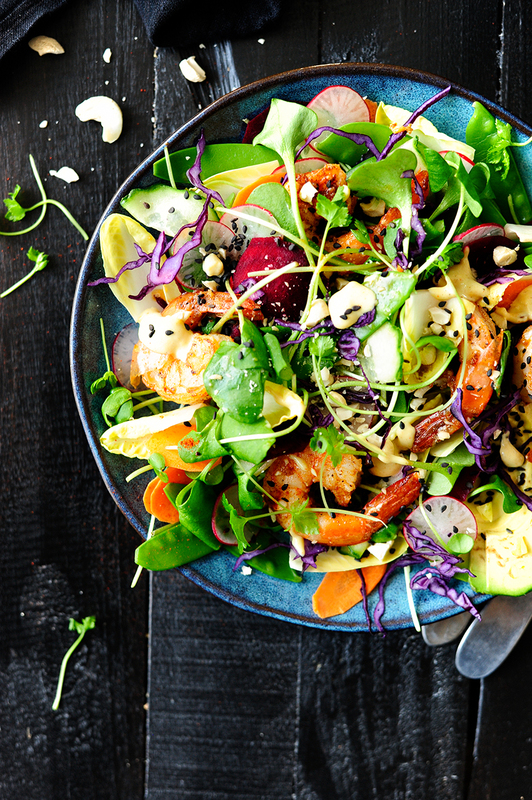 It’s the perfect salad to eat as a light meal, an afternoon snack or a healthy dinner. Anyway, the salad is just great and I hope it will become your new favorite. Bring salted water in a saucepan to a boil and add sugar snaps. Boil for 2 minutes, then drain and rinse under cold water. Peel the carrot and the beetroot, then cut all the vegetables and red onion into thin slices, using a mandolin. Cut the chicory and avocado into slices. Combine all the ingredients for the tahini dressing. Heat the oil in a skillet and add the shrimps. Season with salt, pepper, paprika and cayenne pepper. Fry for a minute on each side. Arrange watercress on the plates, add all the chopped vegetables and sugar snaps. Top with shrimps and sprinkle with parsley, cashew nuts and black sesame seeds. 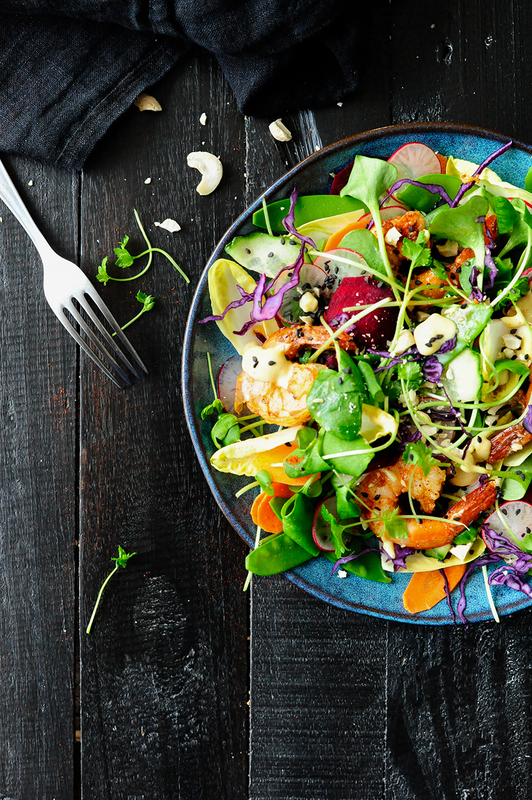 Serve drizzled with tahini dressing. Enjoy!